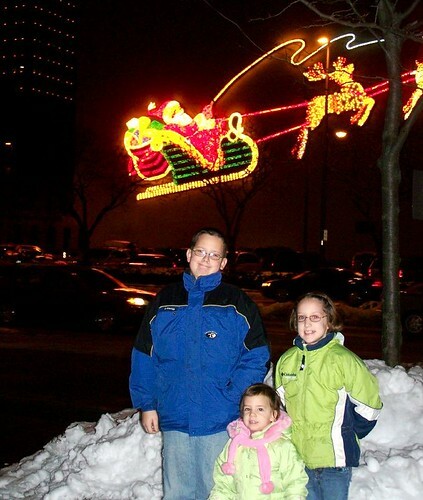 …for the Stouder kids, standing in front of the city’s best-known holiday decoration, the Wolf & Dessauer Santa. It once adorned the side of the city’s largest and best-loved downtown department store. It was where kids from the whole region came to sit on Santa’s lap while their parents did their holiday shopping. It closed decades ago, but the sign was rescued from storage and restored by volunteers, a story that’s retold about every five minutes by one media outlet or another — look, here’s one now. Anyway, it’s a charming display. Here’s a wider shot. The chilluns belong to Brian Stouder, one of our most loyal readers and commenters. From left, Grant (named for the Civil War hero, not the drunken president), Chloe and Shelby. Merry Christmas! Merry Christmas AND Happy Holidays to all the loyal Nancynallers out there, whether you comment or lurk. You too, Nancy. Merry Christmas from the LA contingent. When my son tells me where the charger cable is for my camera, I will take a photo of the Christmas cactus, which is having a second bloom in time for the holiday. While I always enjoy seeing the Santa display, it’s really a memorial to the Fort Wayne that once was … and is no more. Merry Christmas to all – and here’s looking forward to seeing some more holiday images! Very Merry Christmas to all . . . peace and good will throughout the coming year, as we can help to make it happen, wherever we are. Good news is being born all the time, right around your corner. Indeed, a very Merry Christmas to all. I’ll definitely send some pictures along after things settle down! The Santa Ana winds came back on Christmas Eve and blew down a lot of the Christmas lights, so I just unplugged them for now. A few years ago, I planted Aloe Vera by the sidewalk parkway, because they don’t require watering and they fill in around the jade plants. Around the first of December, they bloom huge orange flowers that will hang around for a couple of months. No decorating required! Happy New Year, all. Now, I work in the automotive industry (hybrid vehicles) and get a whole week’s holiday. We are taking the ’84 Buick Estate up to Vegas for a couple of days, the only car that will fit the big dogs. They will stay in my wife’s friend’s back yard. Hope the transmission holds up. Ricardo, any car will fit big dogs. It just depends on how cozy you like things. I get two retreivers into the back seat of my beetle. Mary and Ricardo — my ex likes her purple PT Cruiser. She can accomodate the dogs, put her bike right in, carry sacks of feed for the goats etc., etc. I was surprised at what a nice car it is. Small outside, large inside, very inexpensive to purchase new, decent mileage, decent performance and stylish (you may or may not like the looks, but at least they tried). I had a PT cruiser as a rental for a week a couple of years ago and it was pretty nice. I like my beetle better. It’s zippier. But the PT was ok.
sue • LA Mary • MichaelG • Dave K. • Jim • brian stouder • Jeff • Danny • Ricardo • LAMary • MichaelG • LAMary • and YOU.